This tutorial describes how Play applications work, and shows you how to create a page that displays a customized Hello World greeting. You can use any Java build tool to build a Play project. This tutorial demonstrates sbt and Gradle because they both provide the development experience Play is known and loved for, such as auto-reloading, clear error messages, and template compilation. The tutorial procedures assume use of sbt or gradlew commands from a terminal, but you can also integrate Play projects with your favorite IDE. Unzip and run the example following the steps in the README.md file. Note: When you run the tutorial application, it displays web pages with the same content and instructions contained here in the documentation. The tutorial includes a deliberate mistake and having the documenation and application pages open in different tabs or browsers allows you to consult the documentation for the fix when you encounter the error. 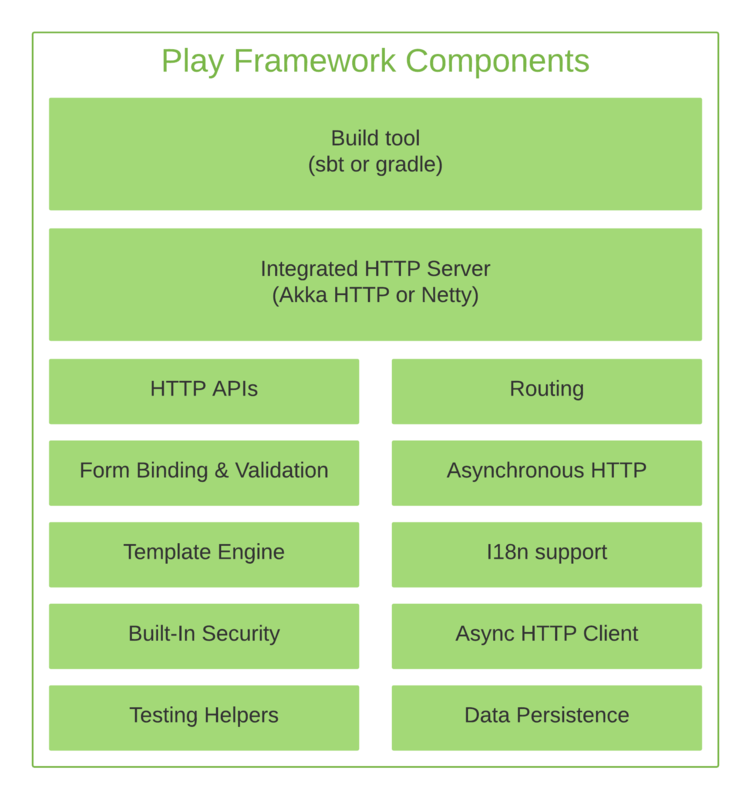 As illustrated below, Play is a full-stack framework with all of the components you need to build a Web Application or a REST service, including: an integrated HTTP server, form handling, Cross-Site Request Forgery (CSRF) protection, a powerful routing mechanism, I18n support, and more. Play integrates with many object relational mapping (ORM) layers. It supports Anorm, Ebean, Slick, and JPA out-of-the-box, but many customers use NoSQL, other ORMs or even access data from a REST service. Play APIs are available in both Java and Scala. The Framework uses Akka and Akka HTTP under the hood. This endows Play applications with a stateless, non-blocking, event-driven architecture that provides horizontal and vertical scalability and uses resources more efficiently. Play projects contain Scala components, but because Play has a Java API, Java developers do not need to learn Scala to use Play successfully. Its Model-View-Controller (MVC) architecture is familiar and easy to learn. Direct support of common web development tasks and hot reloading saves precious development time. A large active community promotes knowledge sharing. To learn more about Play’s benefits, see Play’s Introduction and Philosophy. Now, let’s dive into what a Play application looks like.